Moto X is the first Motorola smartphone since the company was acquired by Google in 2012. Moto X was presented as the first smartphone designed and assembled in the U.S.A. The device uses voice recognition to set an alarm, get directions or launch applications. You only need to say “OK Google Now” and give the command. You can train a little in a quiet room and the device learns how to recognize your voice. Motorola’s smartphone is powered by its own branded chipset, the X8 Mobile Computing System. It’s a dual core 1.7 GHz Qualcomm Snapdragon and 2GB of RAM. 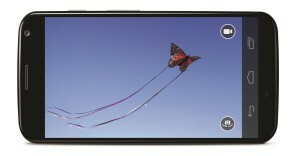 The display is 4.7 inces with 720p Super AMOLED. The fact that the screen has not a 1080p resolution, allows the battery live increases to hold a whole day (with a 2.200 battery). The device is available with either 16 or 32 GB of non-expandable storage. Besides, Moto X owners get 50 GB of Google Drive storage free for two years. And it also included some other extra features, like assistance on the road. The smartphone knows when you are driving, so it can read out who is calling to prevent you get distracted by a phonecall. Moto X also includes a 10 megapixel camera with “Clear Pixel” technology, which improves its performance in low light conditions. However, there are several software updates, but Verizon had some important problems distributing them. So, Motorola has decided to move forward. Now you can find the Moto X’s camera app available at Google Play. Unfortunately, Motorola’s camera is not compatible with the Droid lineup. Motorola is going to update the software of several devices to Android 4.4. The company has announced that Moto X, Droid Ultra, Maxx, and Mini should have an update to Android KitKat in the next days. When available, you can find the updates at Motola’s upgrade website. Source: TheVerge. Camera app, android 4.4.